Following up on his campaign promise to create more American jobs and protect the steel industry, on March 8, 2018, President Trump announced tariffs on imported steel and aluminum under Section 232 of the Trade Expansion Act of 1962, as amended, to defend national security. After the year-long Section 232 investigation by the U.S. Department of Commerce, President Trump ordered a 25% tariff on steel imports and a 10% tariff on aluminum imports, initially exempting Canada, Mexico, Australia, South Korea, Brazil, and the EU. In late March, South Korea was exempted from the tariffs after agreeing to an absolute quota as part of the revised U.S.-Korea Free Trade Agreement. In early May, agreements were reached to indefinitely exempt Argentina, Australia, and Brazil from steel tariffs, and to indefinitely exempt Argentina and Australia from aluminum tariffs; Argentina agreed to steel and aluminum quotas instead, and Brazil agreed to a steel quota. No agreements were reached with Canada, Mexico, or the EU, and by June 1, 2018, tariffs were imposed on these allies, even though Canada and Mexico are two of the U.S.’s largest trading partners. On July 25, 2018, the U.S. and the EU announced a preliminary deal to work toward removing tariffs. By early August, President Trump ordered a doubling of Section 232 tariffs, from 25% to 50%, on steel imports from Turkey due to Lira devaluation. Why should Asset-Based Lenders be concerned about the tariff news? Borrowers’ inventory purchasing costs increased almost immediately as a result of tariff announcements, with domestic prices for steel and aluminum surging. Hot-rolled steel coil prices increased over 30% from the end of December 2017 through April 2018 and currently sits at $830 per net ton, approximately 35% above year-ago levels. Pricing for #1 steel busheling scrap, the prime grade of scrap generated from manufacturers and steel processors, and a key input into steel making, steadily increased from $341 per gross ton as of December 31, 2017 to $396 per gross ton as of August 31, 2018. Meanwhile, the domestic transaction price for P1020 aluminum ingot increased over 21% from an average of $1.03 per pound in December 2017 to a peak of $1.25 per pound in May 2018 due to sanctions imposed by the U.S. in early April against Russia-based Rusal, the world’s second-largest aluminum company. The price of P1020 has receded in recent months, but still remains approximately 8% above year-ago levels. The elevated transaction price has been driven by a historically high Midwest transaction premium, which increased from $0.095 per pound in December 2017 to a peak of $0.215 per pound in May 2018, currently sitting at $0.204. At the same time, the London Metals Exchange (LME) cash price of aluminum has been receding from a high of $1.04 per pound in May 2018 to an average of $0.92 per pound through September YTD. 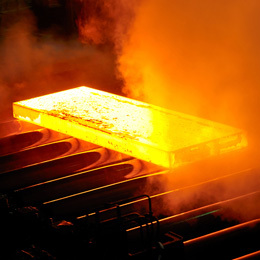 Recent inventory appraisals, particularly of major steel service centers, have seen gross recovery rates increase, based on perpetual inventory book costs, due to the more favorable variance between market price and cost as a result of the increased market price environment, coupled with service centers strategically purchasing inventory during a lower price environment. Additionally, slight increases in gross margins have been noted in the interim due to the quickly increasing market prices earlier in the year as companies sold through previously purchased lower-cost inventory. How is the health of the domestic steel and aluminum market? A key monitoring point for the U.S. steel industry is the U.S. steel mill capacity utilization, which reached 77.5% YTD through the week ended September 22, 2018 as reported by the American Iron and Steel Institute (AISI) versus 74.4% YTD 2017. While the 77.5% mark represents an increase in the capacity utilization YOY, the target for the industry is 80% or greater, which allows for long-term sustainability and is quoted as one of the goals in implementing the Section 232 tariffs. Beginning in 2000 and through 2017, raw steel production and employment in the industry continued to decline. According to the AISI and the Bureau of Labor Statistics, 2010 raw steel production totaled 112.2 million net tons with 135,000 total jobs. By the end of 2017, raw steel production had declined to 86.5 million net tons and employment had slipped to 83,000 jobs. Meanwhile, raw steel capacity in China during the same period increased from 120 million metric tons to over 1.0 billion metric tons and today accounts for over half of the world’s steel production capacity. In June 2018, China set a record for daily average output of steel, thus pushing first-half volumes to over 451 million metric tons. According to Goldman Sachs Group, Inc., China’s capacity has shrunk by an estimated 200 million metric tons to approximately 800 million metric tons in total as a result of state-ordered closures and the impacts of the world steel market collapse in 2015. Aluminum followed a similar path as U.S. production of primary aluminum decreased for the fifth consecutive year to 740,000 metric tons in 2017, declining by about 12% from 2016 and 64% from 2012. According to Light Metal Age, this was the lowest level since 1951, when production totaled 759,000 tons. The 2017 production of 740,000 metric tons represents a capacity rate of only 37.0% of the estimated domestic capacity of 2.0 million metric tons. In June 2017, prior to the announced 10% tariffs on imported aluminum, Alcoa announced a restart of the Warrick aluminum smelter in Evansville, IN, with a total of three potlines at a rate of over 160,000 metric tons per year. Two lines started in July 2018 and the third is scheduled to start by the end of the year to supply the adjacent Warrick rolling mill. Following the implementation of the March tariffs, Century Aluminum announced a $100 million investment to restart production and upgrade technology at its Hawesville, KY smelter and add 300 jobs. Magnitude 7 Metals also announced plans to reopen the former Noranda aluminum smelter in Marston, MO, bringing two of three production lines back into service over two years. However, China also holds the leadership position in world primary aluminum production, making up over half of the global output. According to the U.S. Geological Survey, China was poised to produce 32.6 million metric tons in 2017, with Russia in a distant second position at 3.9 million metric tons. What is the down-stream impact of the Section 232 tariffs? According to Peter Nagle, a senior economist with the research firm IHS Markit, the already enacted tariffs on imported steel and aluminum have added about $240 to the cost of producing a new car, truck, or crossover vehicle. The cost of a typical vehicle sold in the U.S. is approaching $35,000 and vehicle loans are being stretched out to record levels of 60, 72, and even 84 months. In late May, John Deere CEO Samuel Allen said the company would cut costs and raise prices to reflect higher steel expenses and transport costs as John Deere begins taking orders for 2019 models late this year. In late July, Caterpillar said it expected the tariffs to shave $100 million to $200 million from its bottom line in the second half of 2018, and Caterpillar intends to largely offset these impacts through price increases. On August 13, DowDuPont Inc. expected the tariffs would add hundreds of millions of dollars to the cost of building new chemical plants along the U.S. Gulf Coast. Packaging company Ball Corp. has requested an exemption from tariffs on the aluminum used for beverage cans. The Can Manufacturers Institute, a packaging trade organization, believes the tariffs will increase the cost of a can by one cent, which translates into $1.1 billion that the industry and consumers will unnecessarily pay to the U.S. government. Best Buy Co. CEO Hubert Joly said appliance suppliers like LG Electronics had already raised their prices by about $50 after the Trump Administration imposed tariffs on imported washing machines, and the retailer has passed those increases on to the shoppers. What should Asset-Based Lenders watch for in the coming months? With the elevated domestic pricing seen this year, and particularly the quick and precipitous increase in pricing during the late spring and early summer, many service centers and steel consumers were quick to stock lower-cost steel in the increasing price environment. As we head into the fourth quarter, those lower-cost stocks will have worked their way through the companies’ books, and inventories will be much more aligned with current market rates. As a result, margins should return to normal after a short-term uptick and may be negatively impacted for those companies that are unable to pass costs along to the consumer. Unpredictable, yet crucial, will be the Administration’s treatment of the current implemented tariffs, as any change—whether it be an additional levy or exemption of certain countries—will have a direct impact on domestic pricing. Michael A. Petruski, Executive Vice President and General Manager, Great American Advisory and Valuation Services, has over 30 years of collateral evaluation and appraisal experience in asset-based lending. Prior to joining Great American Group, Michael worked for Wachovia Capital Finance, a Wells Fargo Company where he managed the Collateral Evaluation Group, as Director, Appraisal. Previously, he was with Citigroup’s Structured Finance Division as Vice President, Collateral Evaluation. As a former executive with the American Can Company, Michael was Director of International Machinery Sales, a Director of International Metals Procurement. Michael has an BA from West Virginia University and a MS-Administration from Western Connecticut State University. 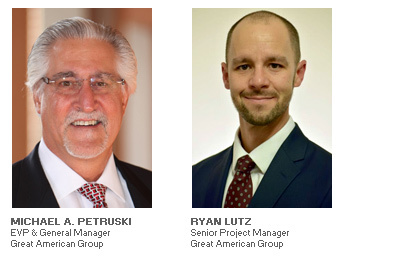 Ryan Lutz, Senior Project Manager, Great American Advisory and Valuation Services has over 12 years of collateral valuation experience with a particular focus on metals inventories. Ryan has led the metals and metals manufacturing inventory valuation practice since 2010 for GA, participating in numerous high-profile deals. He has also managed appraisals for furniture, textile, and industrial manufacturing products, amongst others. Ryan attended Babson College, earning a Bachelor of Science degree in Business Administration with a concentration in Finance. He has successfully completed the USPAP course of instruction as administered by the AMEA and is qualified to opine on inventory values based on a full range of value concepts.